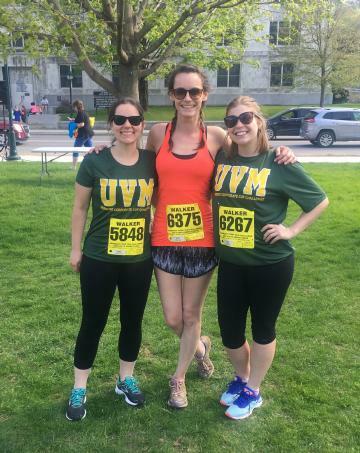 Berger/Stumpff Grad students win team speed walking division of the Vermont Corporate Cup! Haein Kim successfully defended her Ph.D. degree titled: Temporal coordination of mitotic chromosome alignment and segregation: structural and functional studies of KIF18A. on May 15, 2018. Haein is a graduate student in Jason Stumpff’s lab. Congrats Haein!! Leslie Sepaniac, CMB student, was selected to present her work at NASA’s National Council of Space Grant Director’s Meeting on March 2nd, 2018. Leslie’s is awarded a NASA fellowship for research on “Different mechanisms of micronucleus formation and impact on genomic stability”. Jamie Stern successfully defended her Ph.D. degree titled: “Single Molecule Imaging Reveals Tau Structure and Function on the Microtubule Surface” on Wed. Mar 21, 2018. Jamie is a graduate student in Chris Berger’s lab. Congrats Jamie!